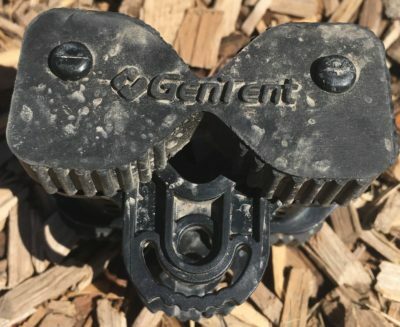 In full disclosure, GenTent reached out to Camp Addict to see if we would like to review their unique product, the GenTent generator cover. Having previously been aware of the product and liking the concept, we accepted. They sent us one for review. The GenTent still in the box. We received the one for 1000-3000 watt inverter generators. We selected the GenTent to cover a Yamaha 2000is, my (Kelly's) generator. The model GenTent portable generator shelter we received fits most inverter gennies under 3000 watts, so it can fit both the Yamaha generator Kelly has, and the WEN generator that both Kelly and Marshall own. For inverter generators (the most common type of portable generator that RVers use), GenTent makes two models - one for 1000 to 3000 watt inverter generators, and one for 3000+ watt inverter generators. See the box below for more information. Marshall has the ability to put his generator under his slide to keep it out of the rain (windows closed and he's only done this about twice in 4+ years). I did not have this option, so I got the GenTent generator cover. Running a generator in wet conditions can be dangerous. After all, you are dealing with electricity. Electricity and water aren't a good mix. 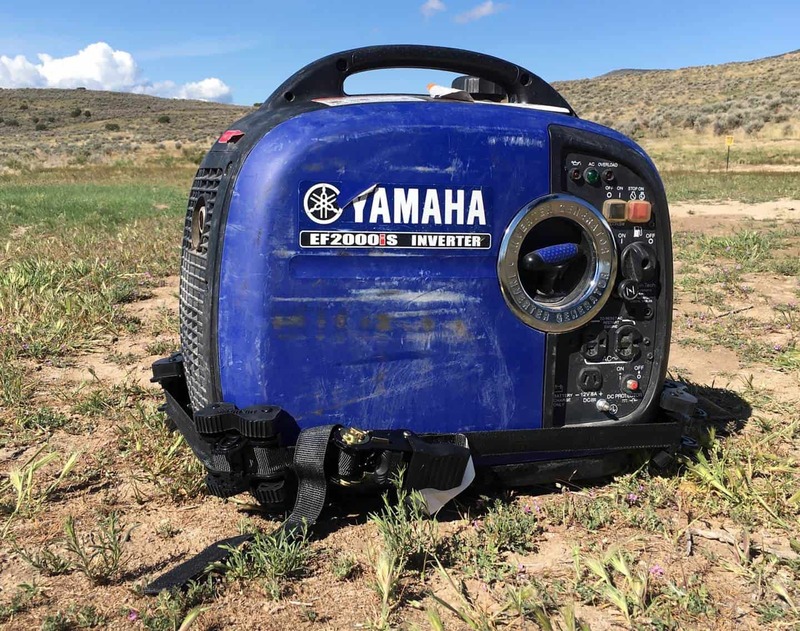 Being able to use a generator cover while running your generator means you protect it from the weather, while still supplying power to your rig. After unpacking the parts from the box, for me, it looked a little complicated to set up. Marshall has that detail-oriented, spreadsheet kind of brain, so he wasn't intimidated. However I am NOT very patient or good when it comes to details. I would have been pretty frustrated and lost on my own. Guess who did the assembly? Yep, thank god for Marshall, once again. 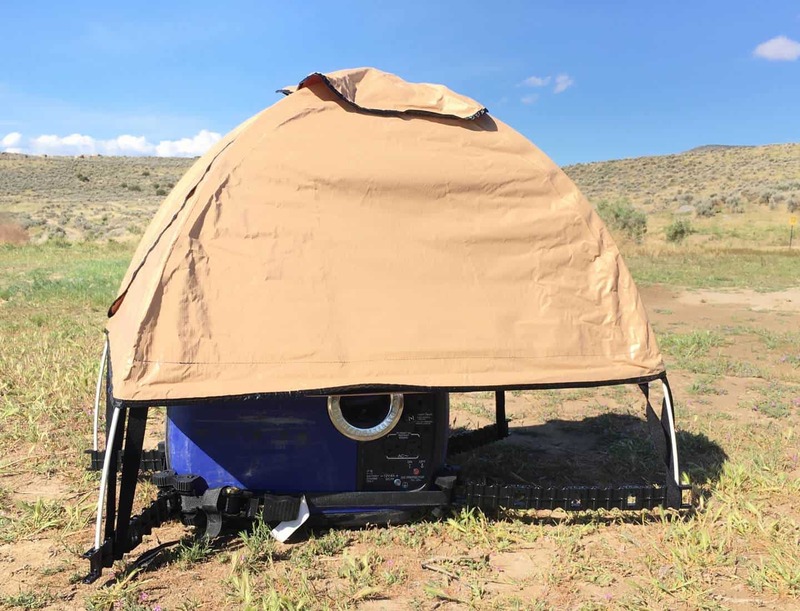 The GenTent generator cover comes with 'legs' (or the base), straps, frame, and the actual canopy itself. 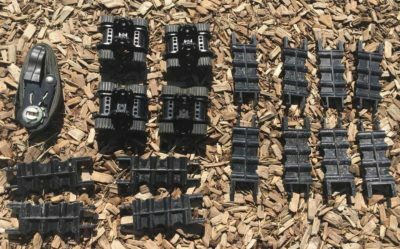 All of the materials are very sturdy and made of impressive quality. All in all, this setup is the perfect solution for keeping a generator dry in the elements. Fitting the legs and straps onto the generator properly does take a little finessing, figuring, and measuring. Thankfully, GenTent provides instructional videos that are essential to learning how to set up the GenTent. 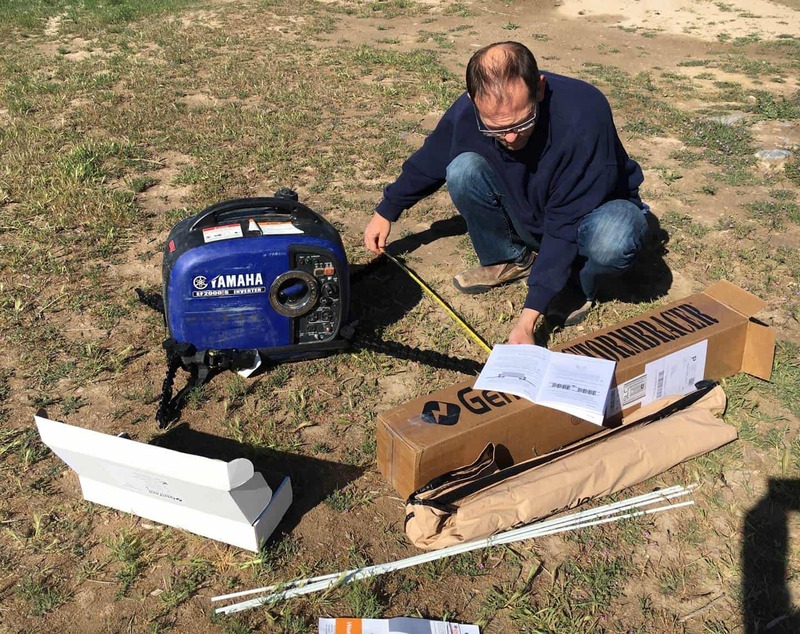 The GenTent generator tent also comes with a paper instruction manual. Their videos are set up in sections, a video for each assembly of 'x' part. This may make the whole process a little easier to follow. Marshall basically did the initial assembly, with my 'help'. (Which consisted of me standing there watching, and taking photos.) ? Measurements are required during assembly to get the base frame properly aligned and prepped for the generator tent cover. One must know how to use a ratchet strap, or quickly learn how to use one. This was another frustration for me. I'd never used one before. Luckily Marshall did know how to use it and taught me. 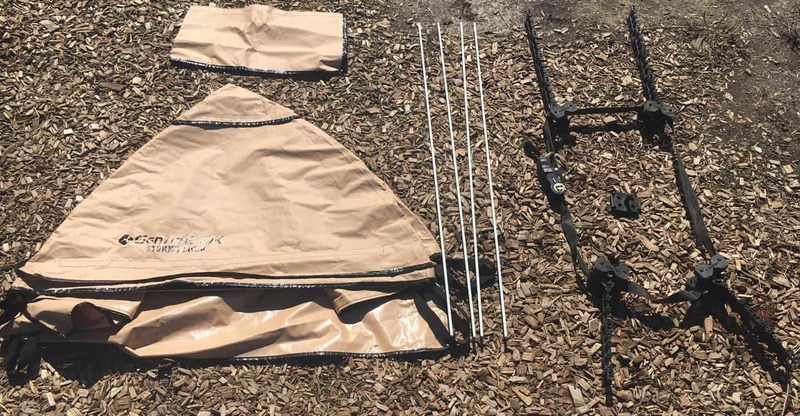 The portable generator tent comes in a long box to accommodate the length of the tent, the frame poles and has an accessory box included as well with the parts you put together via the video instructions. Taking the accessories out of the smaller box was sort of an 'oh crap' moment for me. Looked complicated. The smaller box contained the ratchet strap, the 'arms' that support the base of the frame (and they are in sections that you must assemble together to create the proper length from the end of one leg to the other). Clicking them together (and especially unclicking them) is not the easiest process but with a little practice one will get the hang of it. We wish that these parts had been pre-connected to fit my rig so that this assembly wasn't necessary. Instead what you get is a 'generic' kit that will fit more than one make and size of generator. We did have to use all of the parts on the Yamaha. Once the 'arms' are assembled, and measured for proper fit, one must assemble the corner pieces, or 'angle braces'. They have grommets to attach to them depending on the slope of your generator. If you get it wrong, the angle of the arm will be 'off'. Then they must be slid through the ratchet strap in the correct configuration so they fit properly around the base of the generator. You want the arm to be fairly level, and the grommets will help this happen when installed correctly. Next, tighten the ratchet strap, and boom, you have a secure base for the tent. The rest was pretty simple. There's a top piece that the four frame sticks fit into. 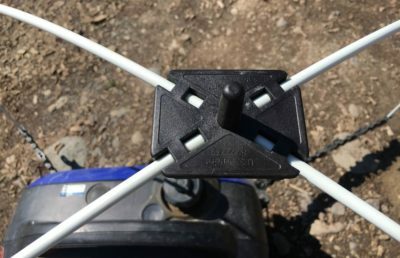 Place the ends of the tent frame into the top connector piece, then put the other ends into the end of the arms. Boom. You have the generator tent frame. The rest is super easy. Place the fabric tent on top of the frame and secure it to the arms with the stretchy pieces at the end of the tent. Velcro the extended cover down in front of the area with the controls as the last step. The GenTent comes with a built-in velcro side section so you can even fuel up when your unit is covered. I was able to use this portable generator shelter in Salt Lake City and again in Pagosa Springs. The next time I used the generator cover, with the arms and ratchet strap still intact, I had to do a little finagling of the parts to get everything straightened out. Still, It wasn't nearly as much work. 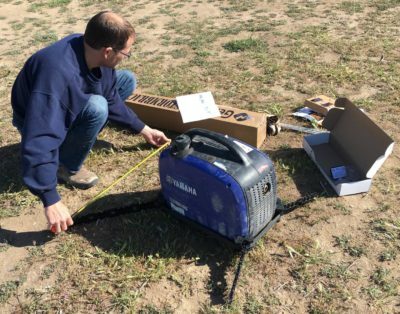 Once you get the hang of assembly, it's pretty easy to setup this portable generator cover. If you are mechanically oriented you will be fine. I am just SUPER lazy and not at all mechanically oriented so taking this out to use in rain was very frustrating at first. Even without taking apart the strap from the legs/arms. After the initial two workings of figuring out how to set up the generator cover, (without taking it all the way to being completely unassembled) it was not bad at all. If I had to go through the entire assembly every time, I would personally never use it. Too much work and measuring for lazy me. The GenTent cover kept my generator totally dry during rain. It is designed to allow exhaust to blow out and to keep the whole generator, especially the control area, from getting wet. It did this very well. I have not used it in snow however, so Camp Addict cannot attest to that. It would definitely keep snow away from building up too much on the sides. The exhaust would melt any snow trying to build up on that side of the unit. Each GenTent portable generator tent is made specially for different models. When ordering, you simply have to let them know which generator you have and they will send you the correct model to fit your individual generator. 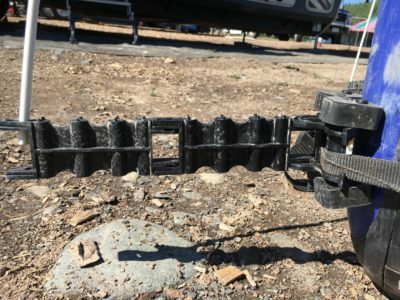 Keeping the arms assembled and the ratchet strap connected to them will greatly speed up the process of putting your portable generator tent together. I already have another rain-proof system in place now that I have two generators. I (and by 'I', I mean MARSHALL) built a box that keeps my two generators from tipping over in the back of my truck. When in use, I slide them out in the box onto the tailgate. However, if it's raining, I will simply leave them inside the canopy and open the top for some ventilation. Much easier on my back than getting the generator out of my truck for ANY reason. But that's me and my setup. Why didn't I do this before? Honestly, and a little embarrassingly, I just hadn't thought of it. No worries on exhaust really, as I am not IN the truck when it's running, nor does it usually rain for long where I boondock. So, no worries about heat build-up or anything. 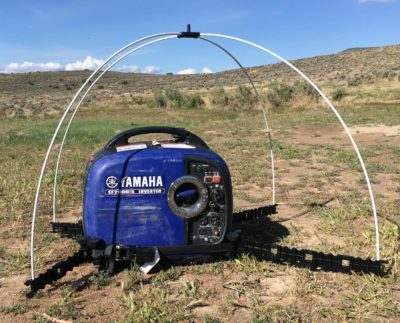 For me to now take out my Yamaha and cover it with the Gen Tent, this would mean I have to take apart the parallel cables and lift the generator and put it on the ground. Not going to happen when I can now use it as-is in my truck. 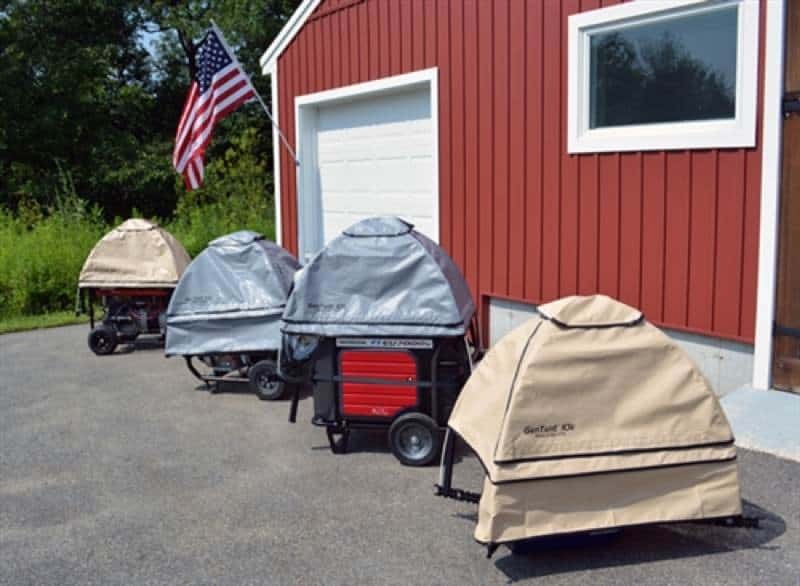 If you use a generator somewhere that has no cover and it needs protection from moisture, then a generator rain cover is for you. If you are detail oriented and careful and meticulous about your generator and safety, it is right up your alley. If you are lazy like me, you may find the installation process of this generator rain shelter, as well as the setup process, too tedious to deal with and you will find another way to cover your generator. This generator cover is a very well made product. It does the job as advertised. It just depends on your level of meticulousness and detail orientation for having the patience to do the setup each time you need to use it. We think it's a great product for the right person and situation. But living in such a minimalist manner, the GenTent takes up valuable real estate in my truck. And getting the Yamaha out of the truck has always been really hard on my back. I am now using the truck bed itself for protection/cover so I don't have to deal with the lifting. Still, I did enjoy trying it out, as I always wondered how well the GenTent generator cover worked. A big thanks goes to GenTent for allowing us the opportunity to try this great product and help our readers make a decision whether it will be good for their individual situations or not. The most common type of portable generator that is used by RVers is the inverter generator. These are the quieter (not loud, construction-style) generators that put out 'clean' power for today's sensitive electronics. Below we list the two available GenTent's for inverter generators, as well as a GenTent generator shelter for common sized construction-style generators (non-inverter generators). 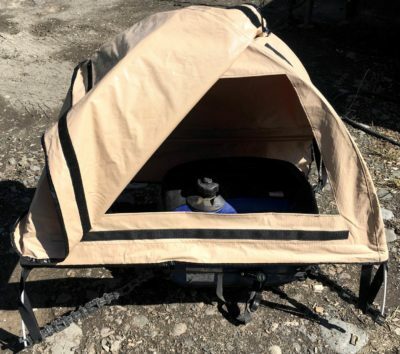 This is the GenTent portable generator tent that we reviewed on this page. It fits most 1,000-3,000 watt inverter generators. You can verify if it fits your generator by visiting the GentTent website and choosing your generator make and model from the top where it says "Find Your GenTent". If you have a larger generator for your RV, you need this version of the GenTent generator rain cover. It fits most 3,000 watt and larger inverter generators. You can verify if it fits your generator by visiting the GentTent website and choosing your generator make and model from the top where it says "Find Your GenTent". This version of the GenTent generator shelter is designed to fit most portable generators (non-inverter style) in the 3,000 to 10,000 watt range. This kit comes with universal frame adapters that fit either round or square tubed frames. 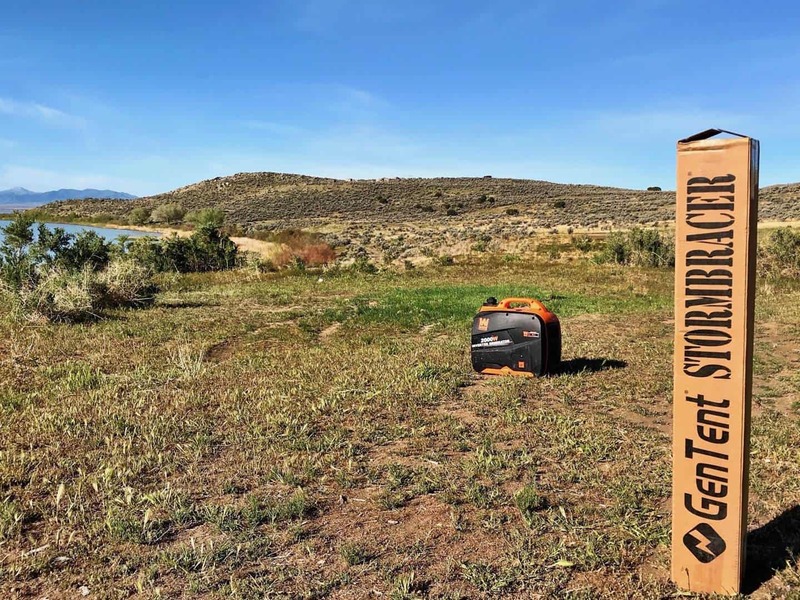 All in all, after personal review, we highly recommend the GenTent portable generator shelter for those who need a generator cover while running their generator. You can buy yours using the links above if you so desire. Thanks for reading, and Camp On, Addicts! Kelly Beasley is co-founder of Camp Addict and loves sharing her enthusiasm for the RVing lifestyle. 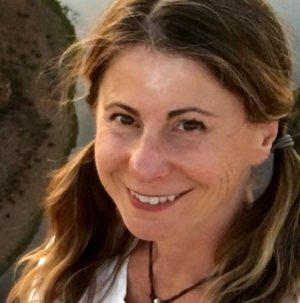 As a full-time RVer since May 2015, Kelly's playful writing style helps make learning about the sometimes dull subject of RV products a bit more interesting. I used my generator in the rain here and there too with no issues. I guess you have no issues until you DO have an issue. Electricity is scary stuff! Please be safe! Camp Addict is a participant in the Amazon Services LLC Associates Program. Amazon and the Amazon logo are trademarks of Amazon.com, Inc. or its affiliates.